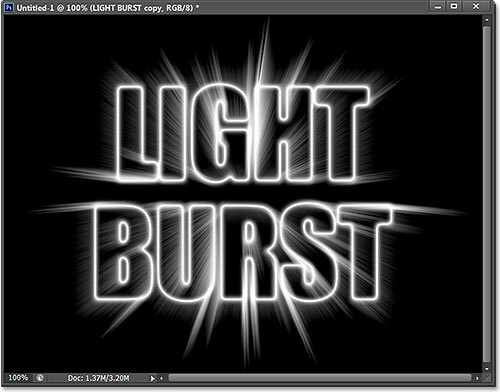 In this Text Effects tutorial, we'll learn how to engulf text in beams of light and color that radiate through and around it. 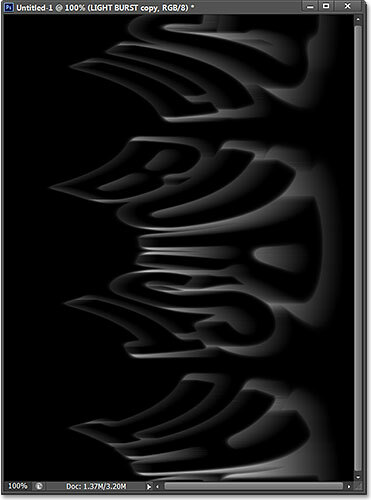 This version of the tutorial has been fully re-written and updated for Photoshop CS6. If you're using an earlier version of Photoshop, you'll want to follow the original Colorful Light Burst Text tutorial. 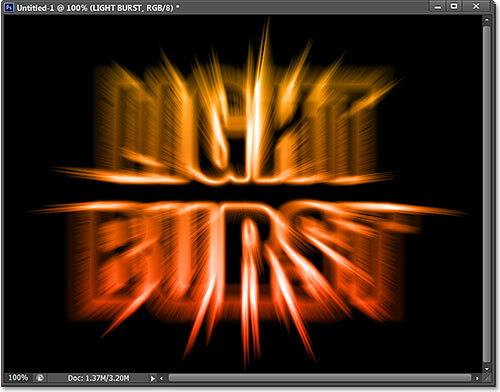 The colorful light burst effect. There's quite a few steps involved in creating this text effect but they're all fully explained and easy to follow, even if you're new to Photoshop. Once again, this version of the tutorial is specifically for Photoshop CS6 users. For earlier versions of Photoshop, be sure to check out the original tutorial. Let's get started! Press the letter D on your keyboard to quick reset your Foreground and Background colors to their defaults, which will set your Foreground color to black (and your Background color to white). 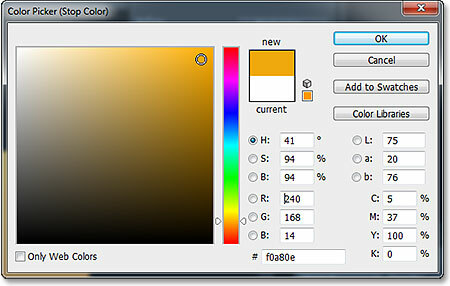 Photoshop uses the current Foreground color as the text color, which means your text color will now be black as well. 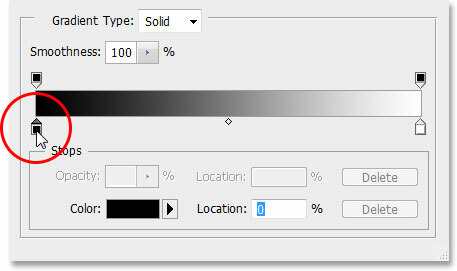 The Layers panel showing the newly added Type layer. Clicking and dragging the corner handles to resize the text. Going to Type > Rasterize Type Layer. 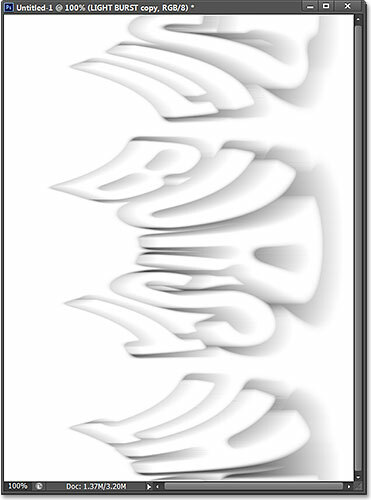 The Type layer is now a pixel-based layer. Clicking on the preview thumbnail while holding down the Ctrl (Win) / Command (Mac) key. A selection outline appears around the text. Clicking the tab for the Channels panel. Clicking the Save Selection As Channel icon. The selection has been saved as a new channel named Alpha 1. Switching back to the Layers panel. The area surrounding the text on the layer is transparent. Only the transparent area around the text was filled with white. 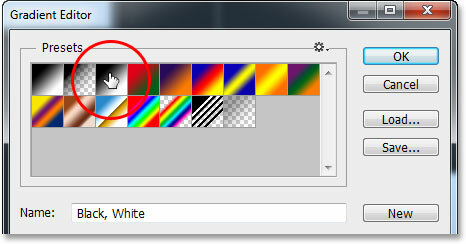 Clicking again on the Background layer's visibility icon. Setting the Radius value to 4 pixels. 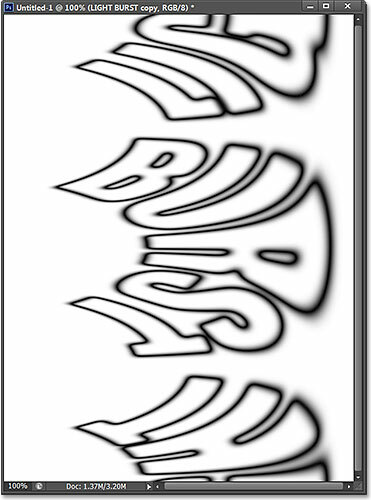 The text after applying the Gaussian Blur filter. Going to Filter > Stylize > Solarize. The text after applying the solarize filter. The text after applying the Auto Tone adjustment. The Layers panel showing the copy of the text layer. Going to Filter > Distort > Polar Coordinates. Selecting the Polar to Rectangular option. The text after applying the Polar Coordinates filter. Going to Image > Image Rotation > 90° CW. The image rotated 90° clockwise. The image after applying the Wind filter three times. The image after inverting it again. 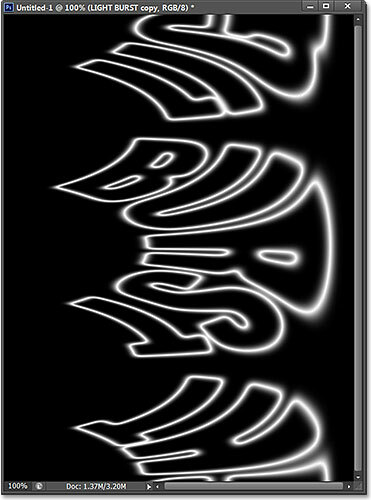 The text after re-applying the Auto Tone command. The image after applying the Wind filter three more times. Going to Image > Image Rotation > 90° CCW. The image after rotating it counterclockwise. 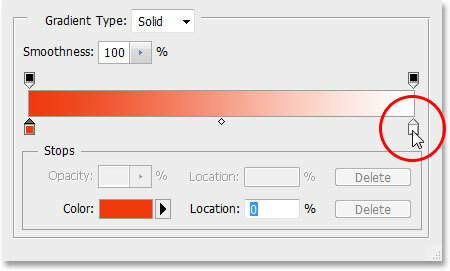 Selecting the Rectangular to Polar option. The image after re-applying the Polar Coordinates filter. Changing the layer's blend mode from Normal to Screen. 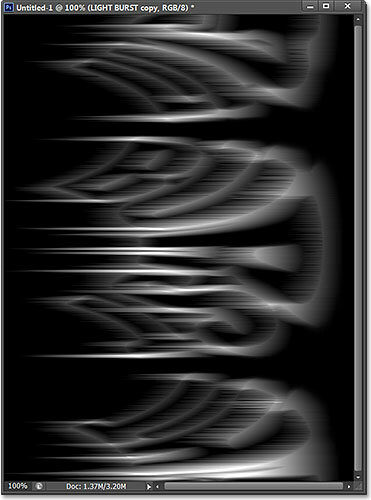 The effect after changing the blend mode to Screen. Adding a Gradient fill layer. Clicking on the Black, White gradient's thumbnail. Double-clicking the black-filled color stop on the left. Choosing a new color for the left side of the gradient. Double-clicking the white-filled color stop on the right. 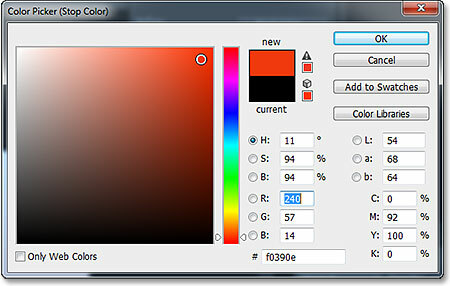 Choosing a new color for the right side of the gradient. The effect after changing the blend mode to Color. Choosing the Convert to Smart Object command. The layer is now a Smart Object. 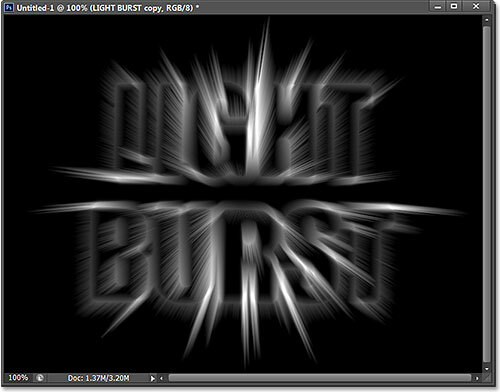 The effect after applying the Radial Blur filter. 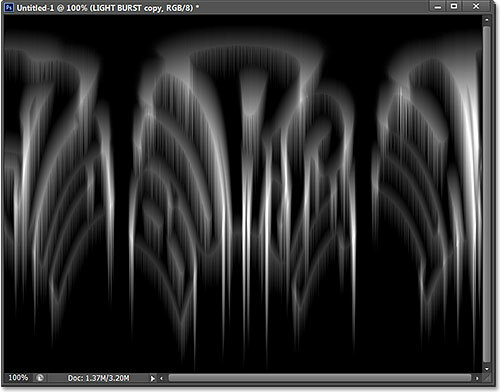 Double-click on the Radial Blur Smart Filter to re-open its dialog box if needed. Hold Ctrl (Win) / Command (Mac) and click on Alpha 1. The selection outline from the original text re-appears. Make sure the Blending Mode is set to Normal this time, not Multiply. And there we have it! 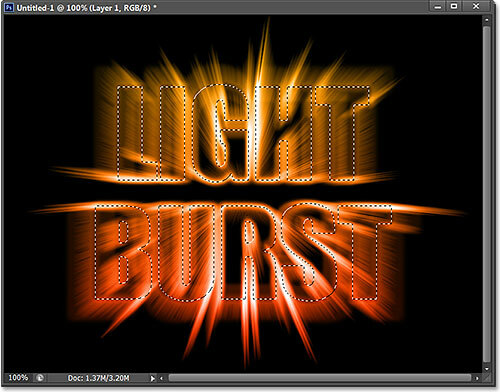 That's how to create a colorful light burst text effect in Photoshop CS6. 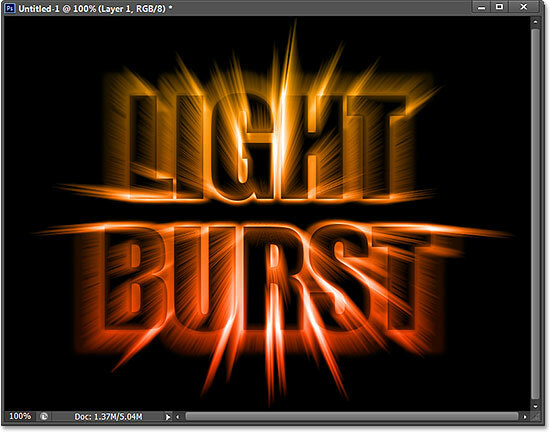 Check out our Text Effects or Photo Effects sections for more Photoshop effects tutorials!